[157 Pages Report] The global gas turbine services market was valued at USD 14.53 Billion in 2015, and is expected to grow at a CAGR of 4.1% from 2016 to 2021. 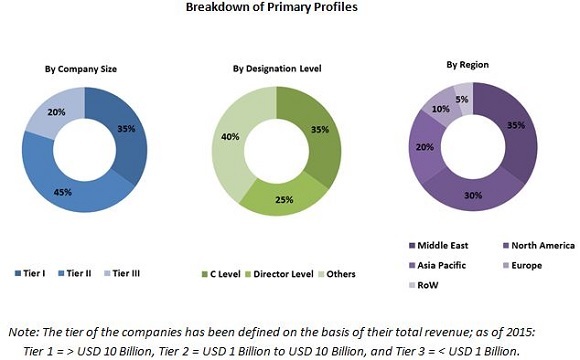 Major drivers for gas turbine services market include upgradation of aging fleet of gas turbines, rise in gas turbine demand due to increase in shale gas production, and stringent emission norms for gas turbines. This research study involved the use of extensive secondary sources, directories, and databases such as Hoovers, Bloomberg Businessweek, Factiva, and OneSource to identify and collect information useful for a technical, market-oriented, and commercial study of the global market. Primary sources are mainly industry experts from core and related industries, preferred suppliers, manufacturers, distributors, service providers, technology developers, standard and certification organizations of companies, and organizations related to all the segments of this industry’s value chain. The points given below explain the research methodology. The gas turbine services market is projected to grow at a CAGR of 4.1% from 2016 to 2021 to reach a market of USD 18.45 Billion by 2021. The growth is attributed to the up gradation of aging fleet of gas turbines, stringent emission norms for gas turbines and increase in demand of gas turbines owing to the shale gas production boom. The report segments the gas turbine services market based on end-user industry into power generation, oil & gas and other industrial. The power generation segment is expected to dominate the gas turbine services market followed by oil & gas and other industrial. Rise in gas turbine installation for combined cycle plants, along with the up gradation of current gas turbine fleet drives the market for gas turbine services for power generation segment. On the basis of service, the gas turbine services market is categorized into maintenance, repair, and overhaul services. The maintenance segment accounted the largest market share in 2015 followed by repair and overhaul segment. Rise in the gas turbine installation will increase the demand for the inspection, monitoring, and preventive & predictive maintenance activities of gas turbines. Thus, driving the market for maintenance services. However, growth rate for overhaul services is slightly higher than the maintenance segment. In this report, the gas turbine services market has been analysed with respect to five regions, namely, North America, Europe, Asia-Pacific, Latin America, and the Middle East & Africa. North America is expected to dominate the gas turbine services market owing to upgradation of gas turbine fleet in the U.S. region and also due to the stringent emission norms imposed by government for gas turbines. The Middle East & Africa is projected to grow at the fastest CAGR from 2016 to 2021 owing to increase in gas turbine installation for combined cycle power plants, especially in the Middle East region. Rise in the gas turbine installation due to shale gas production boom drives the market for gas turbine services. With the rise in the shale gas production there is a rise in gas-fired power generation activities. The low cost natural gas fuel became an attractive option for use in utility power generation, and utilities have embraced natural gas-fired power plants as one the cheapest sources of large scale electricity generation. Increasing focus on renewable energy restricts the market growth of gas turbine services. Also, rising costs of labor, gas turbine spare parts, and transportation will restrict the gas turbine services market. 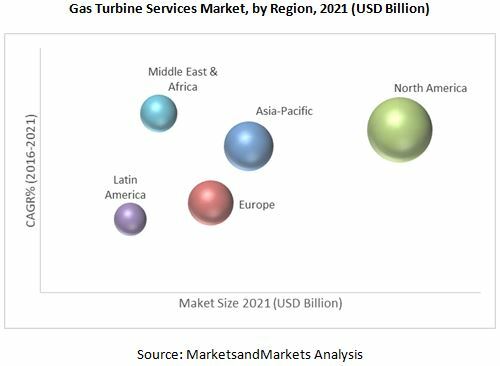 However, the increase in number of combined cycle power plants will create a potential market for gas turbine services market during the forecast period. Some of the leading players in the gas turbine services market include General Electric Company (U.S.), Siemens AG (Germany), EthosEnergy (U.K), Sulzer AG (Switzerland) and Ansaldo Energia, SpA (Italy). Contracts & agreements was the strategy most commonly adopted by top players in the market, constituting 71% of the total developments from 2014 to 2016. It was followed by mergers & acquisitions strategy. 12.8 Kawasaki Heavy Industries Ltd.